A parent and child can read the story together, with the parent coaching the child on the values that underlie each story – such as critical thinking and the dangers of blaming the wrong person or animal. Author Richard Ditchburn debuted in the literary world with the release of “Raine’s Rainbow Socks” (published by AuthorHouse UK) 2015. The first in a charming series for children, this illustrated book can be a fun way for a child to master the different colors of the rainbows while learning how to be more caring and helpful toward people and animals. Raine, when using her rainbow socks, can solve a mystery by going back in time and secretly watching the event unfold or even be a part of that event. When Raine comes back to the present time, she knows how to help solve the mystery. In this book, Ditchburn has woven a fascinating tale that can make children feel like they have been helpful and can give the parent a sense of pride, knowing their child has learned some valuable lessons. “A parent and child can read the story together, with the parent coaching the child on the values that underlie each story – such as critical thinking and the dangers of blaming the wrong person or animal,” the author says. With its vibrant illustrations and engaging narrative, “Raine’s Rainbow Socks” aims to educate a young mind into being kind, helpful and open-minded. Richard Ditchburn was born in the village of Ryton, which can be found in the northeast of England. He grew up in Ryton and still lives there today. When he was 13, he got a job delivering newspapers to houses around Ryton, which gave him a sense of responsibility and fulfillment. At 16, he started as an apprentice on the local council as a mason pavior. A mason pavior is a person who works mainly outside, constructing or repairing footways, roadways and walls. On both these jobs, he encountered many different and wonderful people. 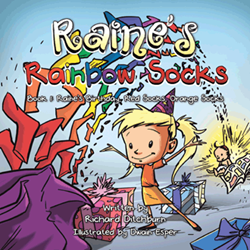 He wrote “Raine’s Rainbow Socks” as a way of showing children the good in life and how helpful they can be like what he has been over the years. At 25, he become a manager of a betting shop and is still a manager today. As a betting shop manager, he is charged with protecting the young and the vulnerable from the world of gambling, which he does very well.